In Barcelona region of Spain they have perhaps the weirdest tradition of all. 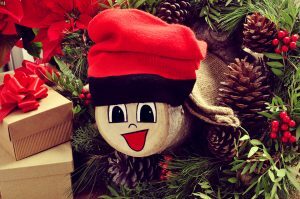 From 8th December Spanish homes have a log which they paint one end with a smiley face, put on the traditional red Catalan flag the “Barretina” and cover the other end with a blanket to keep it warm. Every day until Christmas Eve children feed him treats such as sweets, orange peel and other treats like turrón (sweet almond bar). The idea is that the more they put in, the more treats he will “poo out” by Christmas time. Once they have sung the song they lift the blanket on the end of the log to find treats such as sweets and small toys just like the treats children in the UK find in their stockings. Spain’s New year tradition is to eat twelve grapes at midnight on “Noche Vieja” (Old Night – New Year’s Eve). Every time the bell chimes, you put a grape in your mouth. 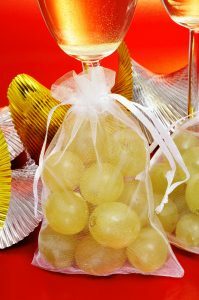 The idea is that if you manage to eat all 12 grapes, you will have good luck for the following year. Everyone does this during a family dinner normally at home or people gather in the Puerta del Sol square in Madrid where the celebration is televised. After the family dinner at home leading up to midnight and the twelve grapes eating then people go out partying until 5 in the morning. Whilst eating the 12 grapes in the last 12 seconds of the year it is supposed to be even luckier if you are wearing red underwear! The story is that if you are to b e lucky in love the next year you must wear red underwear that has been given to you as a gift. In La Font de la Figuera, a village near Valencia, locals celebrate the new year by running through the streets in red underwear. Spain, being the land of many festivals manages to fit in this extra celebration between Christmas and New Year. This is Spain’s equivalent of our April Fools’ Day which takes place on 28th December. On this day, people all over Spain play jokes and pranks on each other. Its origin is religious as it is based on the story in the Bible of King Herod who, upon finding out about the birth of Jesus, a new King of Israel, he ordered the massacre of all boys under two years of age in the area of Bethlehem. This fits well with the name, “Day of the Holy Innocents” given that many innocent souls were lost that night. 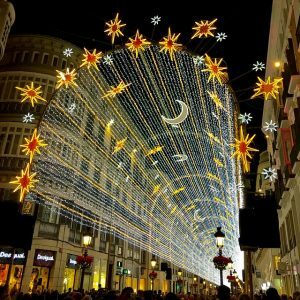 This is a 200-year old festival which also takes place on 28th December (Día de los Santos Inocentes) in a small town called Ibi near Alicante. The celebration involves a mock coup d’état and ends with a major food fight. During the day a group of men dress in military wear, called the “Els Enfarinats” and they try to enforce some new crazy laws upon the locals. Those who don’t abide by these laws have to pay a fine which is later donated to charity. The coup ends in a giant food fight in the main square when revellers pelt flour and eggs at each other. The reason for the event is to mark the killing of innocent boys ordered by King Herod who once lived in the town of Ibi. The celebration also includes fireworks and a mock election.